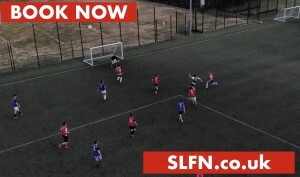 Come down on your own or with a friend for a fantastic kickabout. We will organise everything! We will bring bibs, balls, the referee and even your teammates. Come and have a run out! The surface is fantastic, probably the BEST pitch in London. MAP: Check our map page, find it on the website menu. PITCH: When you come in, we are on the far side pitch, just turn LEFT when you walk into the pitches. There are ONLY 3 pitches, so we are VERY EASY to find.